All transactions are safe and secure with a reliable history in online purchasing behind each of our associates. Buy the Boardwalk Empire Monopoly t-shirt to own Boardwalk Empire clothing and merchandise. This brilliant Boardwalk Empire shirt features Nucky Thompson as the Monopoly Guy. Whether you have to pay Chalky's tax or you want to buy Capone's place, this design will leave you either rich and powerful or broke and on your way to jail. For other Boardwalk Empire apparel, keep browsing our gallery. We have more variety than Babette's bar on the eve of Prohibition, including Nucky Boardwalk Empire costume ideas. 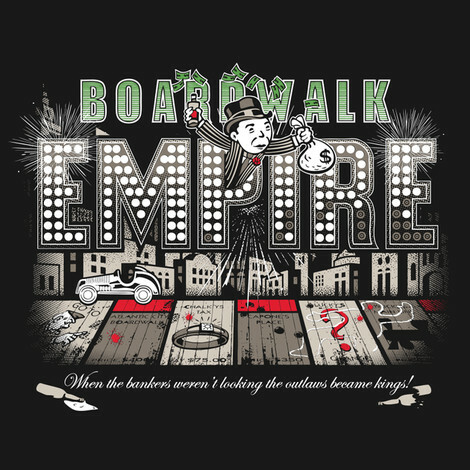 In addition to the Boardwalk Empire Monopoly tee above, browse the Boardwalk Empire Clothing Gallery for more apparel like men's and women's clothes, kids shirts or hoodies.